¡El Capitán! 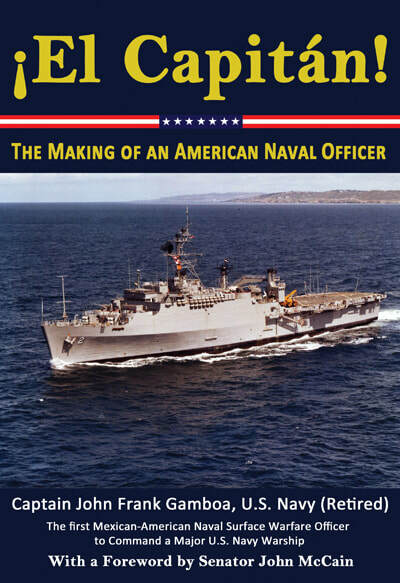 The Making of an American Naval Officer, is the story of Frank Gamboa, CAPT USN (RET). In 1958, Frank Gamboa, a Mexican American from Owens Valley, California, graduated from the United States Naval Academy. His memoir's focus is his professional development as a naval officer of the line from 1958 to 1988 in the U.S. Navy's surface warfare community. It highlights his duties, challenges and opportunities during more than 17 years of sea duty in destroyers, a cruiser, and six amphibious warships operating in the Navy's Second and Third Fleets; and in frequent and extended deployments in the Sixth and Seventh Fleets during the Cold War. ¡El Capitán! portrays the leadership, management, technical and seamanship skills required to succeed in shipboard billets ranging from division officer to commanding officer and squadron commander, in ranks from ensign to captain. Captain Gamboa was the first Mexican-American naval surface warfare officer to command a major warship as a Commander, the first to command major warship as a Captain, and the first to command a squadron of amphibious warships as a Captain. After leaving the Navy, Frank created Gamboa International Corporation, a management consulting company that he and his wife Linda successfully operated in the private sector from 1994 to 2006. In 1989, he was elected Vice President of the Naval Academy Class of 1958, and continues to serve in that capacity. He and his wife live in Virginia. Their son, Jack and granddaughter Emma live in Oregon. Their daughter Judith and granddaughter Loren also live in Virginia.